I had high expectations for this one, Chanel are renowned for quality and the majority of their fragrances are well made and more than a few are considered as classics. I am a big fan of N°19, it is my second favourite Chanel (after Coco) and unfortunately N°19 Poudré fails to even come close to the greatness of the original. There is a distinct flash of N°19 in the top notes, but it is fleeting, blink and you’ll miss it. What makes the original N°19 so great is the harsh overdose of galbanum that makes it smell ‘bitchy’, it’s a force to be reckoned with and you wouldn’t want to go up against anybody who wears it, It’s strong but feminine. There is galbanum in N°19 Poudré but it only really shows itself briefly during the top notes and isn’t anywhere near as concentrated as the galbanum in the original. The main player here is the iris, it comes through very quickly and stays for the majority of the development. The iris is slightly rooty and interestingly it doesn’t feel that powdery, it feels clean and there is a definite soapiness to it that I find quite disappointing. The iris is the biggest let down here and compared to the iris used in the new Shalimar Parfum Initial it feels quite cheap. Vetiver becomes very prominent in the base notes and for a minute you can sense the similarity between Poudré and the original, but only for a minute. The vetiver is blended with a very soft, clean musk, that whilst not being overly interesting it is fairly pleasant. The base lingers for a good few hours but it stays very close to the skin. N°19 Poudré is not a bad fragrance, all the notes fit together nicely and it smells like a pretty green floral of high quality. I doubt that it will strike a chord with N°19 fans, it is a much lighter, softer version, but for those who find the original too harsh, Poudré may be worth trying. N°19 Poudré is N°19 in pastel shades but I like my N°19 in strokes of vivid green. Chanel N°19 Poudré is available in 50ml and 100ml Eau de Parfum and it is just starting to hit the department stores now. Prices range from £61 to £86. This review is based on a sample sprayed in store. 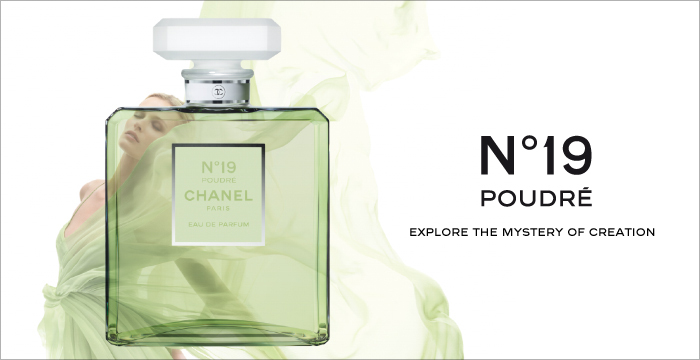 Posted in Chanel, Feminine, Floral, Green, Perfume Reviews and tagged 2011 Release, Chanel, Feminine, Flanker, Floral, Green, N°19, N°19 Poudré. Bookmark the permalink. In all honesty I don’t know what went wrong here, I haven’t given Eau Premiere much of a try but it is a good reincarnation. I think maybe because they wanted to soften the original they took out all of the interesting parts. Is it crazy that I’m still hopeful? I love the original best in EDP, but I haven’t met a green I don’t like… I guess I hope that I’ll be able to appreciate it as a separate entity, because I want and need more greens in my collection! It’s not crazy to be hopeful. I wouldn’t say that Nº19 Poudré is a bad fragrance, it’s just nothing like the original and isn’t really worth of the Nº19 name. Interestingly, Nº19 is the only green fragrance that I love. Chanel Nº19 Poudré was my first unsniffed purchase ever. Do I love it? Not even close. My hart will stay witn №19 EdT forever. But the more I wear it (and while working on my review in July I wore it more than any other perfume in a long while), the more I like it. After the first disappointment settles down and you try to think about the perfume itself and not in relation to its famous predecessor, I think it does smell better. But I wish it was more tenacious on my skin. I find it interesting that you say it’s a grower, it is a pleasant scent taken on it’s own, but it’s still no great shakes. I also found that it was very quiet on the skin. I like it! Soft and pretty- an interesting gateway scent into something a little different than the fruity floral musky perfumes that are kind of everywhere. Accessible old-school, a bit? I’ll be curious to see how sales of this are. Will folks who didn’t like No19 like this one? I imagine that it will be popular with those who found Nº19 too harsh. It is Chanel so I can see i selling very well. I tried this in store on Saturday. Unfortuantely I have not tried the original. The blotter today smells much nicer than at frst, I really get the powdery iris and it still smells aldehydic. I tried Miss Dior (she is working it), Samsara (won the day for me) and original Shalimar (this is completely gone today). I also tried Farenheit (smells gorgeous today). Oh! what have you done to me? Uh-oh, it looks like we may have started something there! It’s good to hear the opinion of someone who hasn’t tried Nº19, would you say it was better than a lot of the scents out there? I don’t know that I would say it’s a lot better, It didn’t leave me gasping for it. But I am going through a tobacco, woody, leather stage (maybe a winter thing). I will give it another roll in a couple of weeks (spring in a week’s time, weather is already beautiful). I didn’t seem to get any of the tobacco or leather, which is a shame, I think it would have held my interest a bit more if I had. It definitely feels like more of a spring perfume.